No book provides a more complete one-stop summation of the Feral House publishing company’s ethos than Apocalypse Culture: criminality, avant-garde art, dark musical subcultures, fetishes which range from the unusual-but-consensual to the taboo-and-definitely-not-consensual, extreme politics of all stripes, secret societies, conspiracy theories and cultural meditations all sit cheek-by-jowl in this collection of essays edited by the late Adam Parfrey, founder of Feral House itself. For Parfrey, it was all about freedom of speech and giving a platform to anyone, no matter how offensive or controversial – if anything, the controversy helped. As Eric Bischoff coined the phrase, “controversy creates cash”, and it’s notable that Feral House’s boom period in the 1990s coincided with an era in which this was never more true. Parfrey’s decisions about what to publish would occasionally spark controversy; Feral House got a tidal wave of condemnation when it put out The Gates of Janus, a meditation on serial killers by Ian Brady, and Parfrey’s pre-Feral publishing venture, Amok Press, put out an English translation of Michael, a novel by Joseph Goebbels. Apocalypse Culture doesn’t quite include any full articles by authors on Goebbels or Boyd’s level (though Parfrey does quote Hitler at one point), but the material here is pretty extreme. That said, whilst Parfrey himself seems to have particular obsessions and points of focus, at the same time the sheer range of extremist opinion offered here is incredible. You wouldn’t expect many of the authors in here to see eye-to-eye on much, except perhaps a certain disregard both for societal norms (as they existed in the late 1980s/early 1990s) and the centre ground which tends to reinforce them. Indeed, the title of the book comes from Parfrey’s contention that the centre cannot hold, and an apocalypse of bizarre and aberrant behaviours is just around the corner. Published books have always been the mere tip of the iceberg when it comes to the conspiracy theory scene, which has historically thrived more on rumour, hastily-photocopied pamphlets and cheaply self-published samizdat. The creation of the Internet has only made this all the more true. Whereas stumbling across hastily-scrawled essays which no reputable publisher would touch (whether they’re afraid of the libel laws or simply don’t want to publish illucid nonsense) used to be a matter of browsing the right second-hand bookshop at the right time, now anyone and everyone has all the platforms they want to publish whatever they like, and by golly they do exactly that. That being the case, Secret & Suppressed is fascinating less because of any of the merits of its contents – indeed, some of the stuff in here is outright terrible – and more because of it capturing a particular point in time. 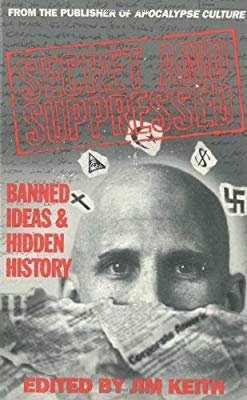 Published in 1993 by Feral House, Secret & Suppressed was a collection of essays compiled from various sources by conspiracy theorist Jim Keith, who was in a position to do this thanks to his contacts made as editor of underground zine Dharma Combat. 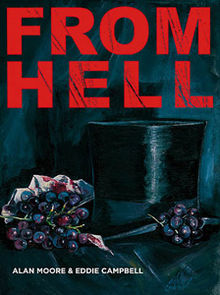 Though in effect the idea wasn’t enormously original – it’s basically a more conspiracy-focused version of Apocalypse Culture, edited by Feral House head honcho Adam Parfrey – I think it’s notable simply because 1993 was right towards the end of an era when a book like this represented a worthwhile endeavour. The Internet was just about a thing at this point in time, with newsgroups and BBSs and gopher sites and the like storing a range of text files on various conspiracy-adjacent subjects, but it had not yet become ubiquitous. These days, anyone writing a piece like those featured here is likely to plaster it all over the Internet for free, rather than offering it up for a book like this. Secret and Suppressed came out in that narrow band of time when the Internet was accessible enough to aid Jim Keith in his research and help Feral House reach a wider audience, but still obscure enough that it hadn’t completely changed the conspiracy theory landscape. It’s the late 1880s, and royal party boy Prince Albert “Eddy” Victor – grandson of Queen Victoria and second in line to the throne – has been having all manner of fun. Encountering Annie Clark, a Catholic woman who works behind the till at a sweet shop just across the road from Eddy’s favourite rent boy brothel, he begins an affair with her which culminates in an ill-advised secret marriage and the birth of a child – one who, strictly speaking, would then be in line for the throne. Queen Victoria will not stand for this, and she uses all the covert influence available to her to make sure that Eddy and Annie are forcibly separated. Among the resources available to her is the power structure of British Freemasonry. With members riddled throughout the British aristocracy and respectable professions, the Masons were a microcosm of the establishment of the time, and a large cross-section of Victoria’s male family members were Masons. Between that and a perennial desire for Royal patronage, it was no surprise that the Brotherhood was willing to do favours for Victoria. In this case, this included enlisting Dr William Henry Gull – Freemason, physician, and mystic – to the task of performing an operation on Annie to profoundly damage her mental capabilities. Even if she could get someone to listen to her story and she were able to coherently tell it through the cognitive fog imposed on her, nobody would give it any credence. However, Annie’s fate wasn’t unknown to all. Marie Kelly, an East End prostitute and friend of Annie’s, is aware of what happened, and also knows that painter Walter Sickert – who had accompanied Eddy on his visits to the seedier side of town – is aware of what’s happened. When she and a group of her fellow prostitutes are shaken down for protection money they don’t have by a local gang, they hit on a plan of blackmailing Sickert for cash. Alas, they get greedy, ask for more money than Sickert has available, and when he turns to his Royal connections for help word of the matter gets back to Victoria, who dispatches Gull to silence the women, permanent-style.